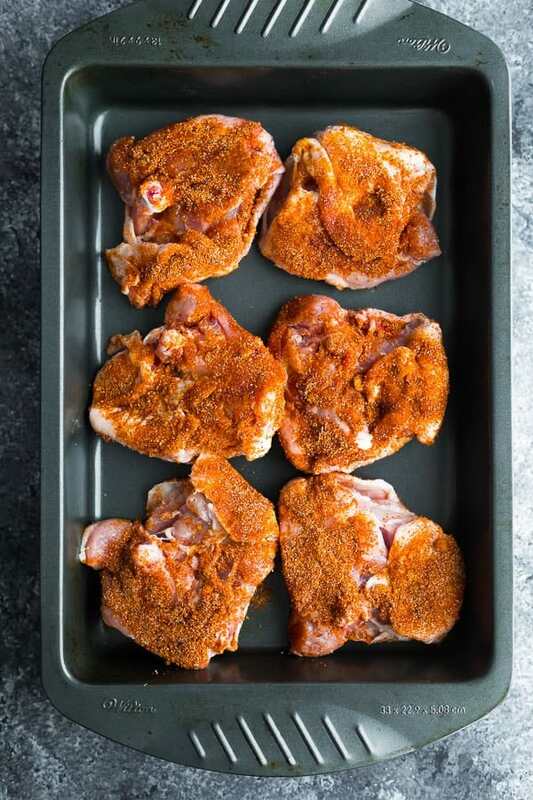 PERFECT baked chicken thighs that are juicy, with crispy skin and the most delicious spice rub. Find out the best way to bake them! After tackling the perfect baked chicken breasts recipe, it was time to tackle chicken thighs! 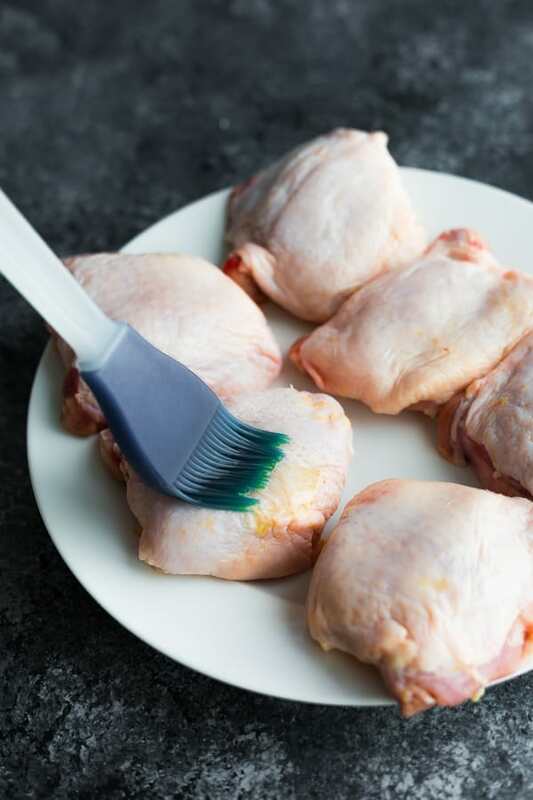 To be honest, we don’t buy skin-on chicken thighs very often, because I always found them too finicky…I’ve had too many issues with them sticking to the pan, skin ending up flabby and chewy, and just all round a pain to deal with. I WAS SO WRONG. Not only are they easy, but the flavor of this recipe completely blew me away!! In fact, even our picky 4 year old gobbled up his plate of chicken and asked for more. <–this never happens. Let’s discuss how to cook the perfect baked chicken thighs! (Note: these directions are for bone-in skin on chicken thighs). My findings? Temperature- go high! Convection- not good for this particular recipe. Skin down- YESSSS in a pre-heated baking dish. Flip at the end to crisp up the skin. 1. 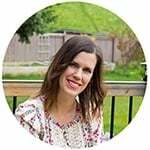 What is the best temperature for oven baked chicken thighs? There are so many baked chicken thighs recipes out there, and they all use different temperatures. I decided to see for myself which temperature was best. In the course of my experiments, I tried three different temperatures. 350°F, 425°F and 450°F. 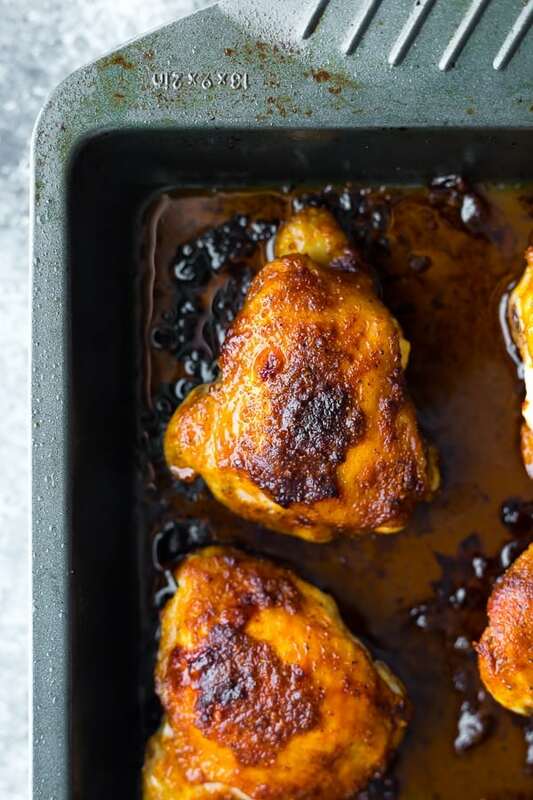 By far, 450°F produced the juiciest oven baked chicken thighs with crispy skin! I also tested convection versus non-convection, and found that while convection-baked chicken thighs cooked through to 165°F quicker, it wasn’t enough time to render the fat under the skin for this recipe. 2. How long to bake chicken thighs? 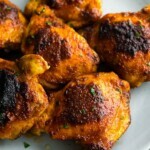 Unlike chicken breasts, which are prone to drying out, you have a bit more wiggle room when it comes to chicken thighs. In general, 20-25 minutes was sufficient to cook the chicken thighs through to 165°F. The best way to determine if your chicken thighs are cooked through is to use a thermometer in the thickest portion of the thigh. When it registers 165°F, they are done! Full credit to America’s Test Kitchen for this tip: bake your chicken thighs skin side down in a pre-heated pan. According to ATK, this helps render the fat under the skin. According to my tastebuds? This does something amazing to the spice rub to bring out SO MUCH FLAVOR. Flip the chicken thighs skin side up for the last 5 minutes of cook time, and you will get nice, crispy skin. Another hugely important factor in getting perfect, juicy oven baked chicken thighs is to rest them. 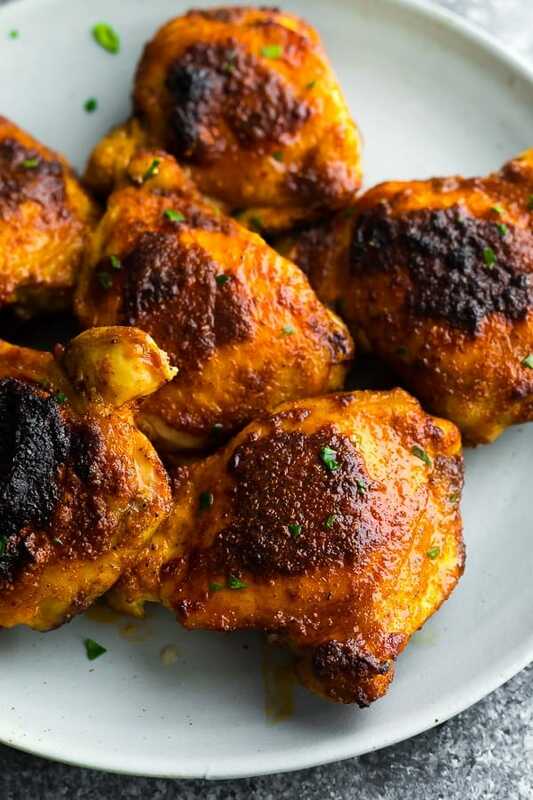 Unlike boneless skinless chicken thighs, you do not want to cover your roasted chicken thighs, as this will destroy that deliciously crispy skin! Either leave them in the baking dish or transfer to a plate to rest for 5-10 minutes before serving. Resting roasted chicken thighs is important because it allows the juices to settle. If you try to cut them right away, all that juice is going to run right out of the chicken thighs all over your plate.
. I recommend a pan over a baking sheet to minimize splatter. I would be hesitant to put a glass baking dish at 450°F, as it is getting close to the shatter point. Be sure to read the instructions that come with your glassware before trying this recipe. Heat oven to 450°F. Place a 9x13 inch metal baking dish in the oven while it pre-heats. 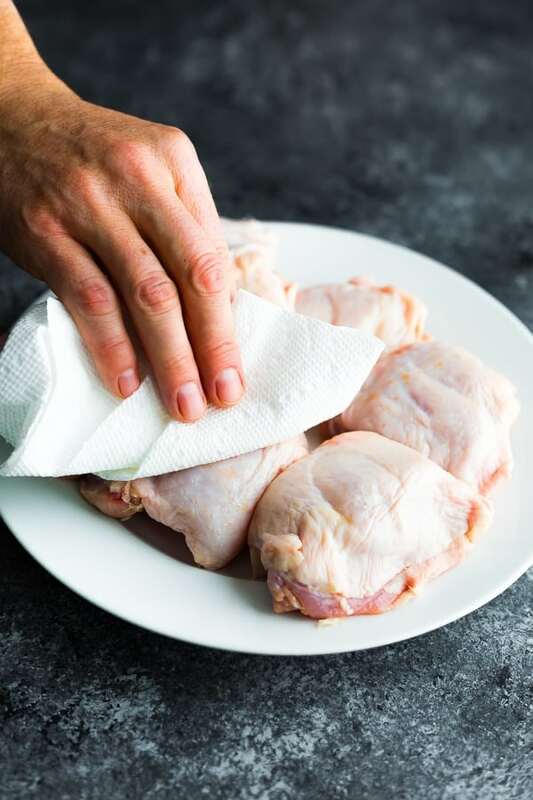 Blot chicken thighs to remove any extra liquid. Poke skin all over with a paring knife. Brush with olive oil on both sides. 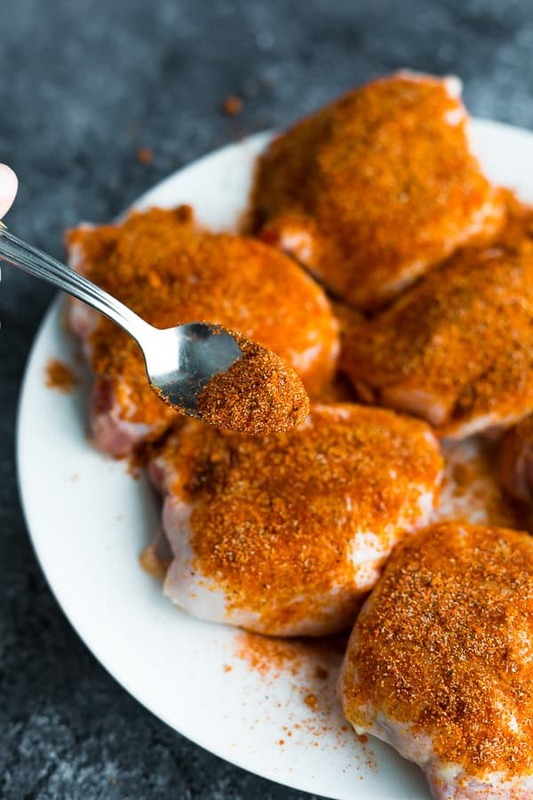 Stir together the spice rub, and rub generously all over the chicken thighs. Using oven mitts, remove the baking dish from the oven, and arrange the chicken, skin side down, in the baking dish. Bake in the heated oven for 20 minutes. Flip skin side up and turn oven to broil Broil for another 3-6 minutes, until skin is crispy. Keep an eye so it doesn't burn. Allow chicken to rest 5 minutes before serving.